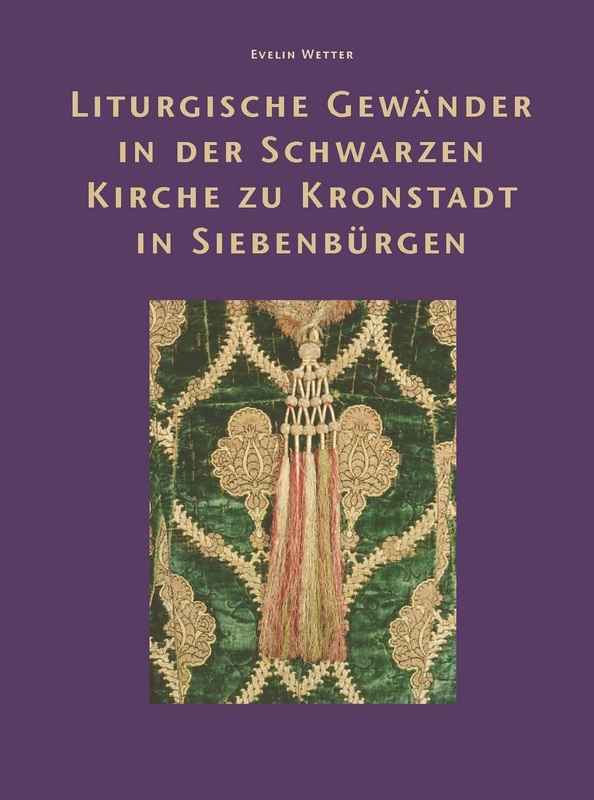 The Abbeg-Stiftung (Riggisberg, CH) published an exhaustive catalogue of the liturgical vestments of the Black Church of Brașov / Brassó / Kronstadt in Transylvania. 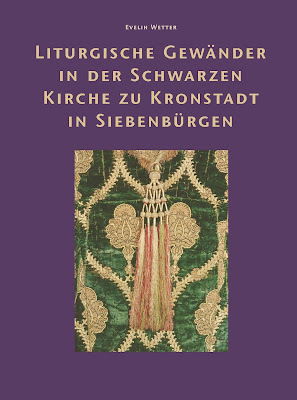 Regarded as the most important ecclesiastical collection of the Transylvanian Saxon churches, interest in the collection started already in the 19th century, but the present book, edited and largely written by Evelin Wetter, is the first systematic catalogue of the medieval and renaissance textiles preserved in the church. Several objects date back to the 15th and the early 16th century, and these remained in use even after the community and its church turned Lutheran in 1543. The origins of the town of Brassó / Kronstadt go back to the early 13th century, when as part of King Andreas II's policies, it was established by German settlers (known in later sources generally as Saxons). 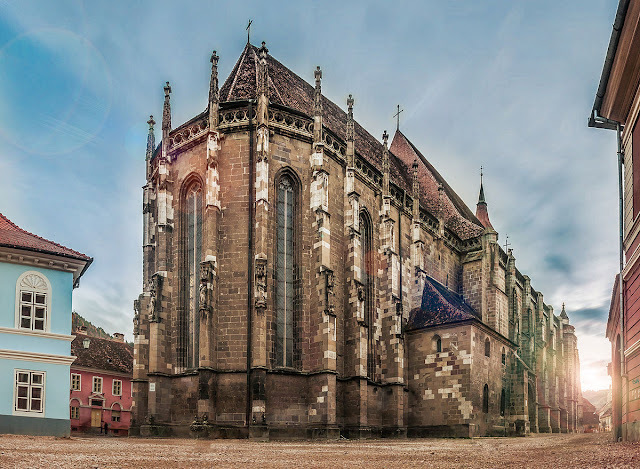 Along with Nagyszeben / Hermannstadt (Sibiu), Brassó became one of the most important Saxon towns of Transylvania, and developed greatly due its favorable position near the border of the Hungarian Kingdom and along key trade routes. The present parish church of Brassó /Kronstadt, dedicated to the Virgin, was built from around 1380 until about 1470, and it is the easternmost major Gothic building of medieval Europe (it is also the largest medieval church in all of Transylvania). The original fabric of the church was heavily damaged in a fire in 1689 - hence the name of "Black church." After the fire, a slow rebuilding process started, during which the entire church had to be re-vaulted, which was carried out in a Gothicising spirit. Despite the fire, the church has preserved a remarkable array of its treasures. The treasury holds medieval chalices and other goldsmith works, and the church also preserves one of the largest collection of historic Ottoman Turkish carpets in the world. The subject of the present book is another ensemble, that of the liturgical vestments. The catalogue includes 21 objects, a few of which have been brought to Brasov from smaller communities. There are six copes in the collection (cat. 1-6), originally stemming from the late 15th - early 16th century, and made from the finest Italian (and in one case, Ottoman Turkish) velvets. 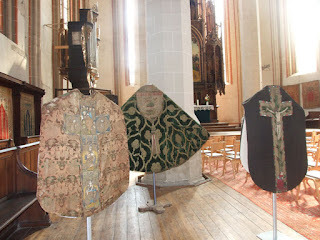 There are also five Baroque chasubles (ca. 9-14), preserving outstanding late medieval or early Renaissance embroideries, along with two further separate cross orphreys. The book has been produced in an exemplary manner. I mean this in many senses of the word: first of all regarding the nature of scholarly collaboration. Evelin Wetter, the editor of the the volume, and a noted expert of medieval liturgical objects, started researching the collection in 2001. She has worked together with Ágnes Ziegler, who has worked as the art historian assigned by the church next to the collection for several years now. A study tour was made to Brasov from Riggisberg each year, where the third author of the volume, textile conservator Corinna Kienzler was also regularly present. The result in an exhaustive work, which examines and publishes the textiles in great detail. After the introductory essay by Evelin Wetter, there are 6 long studies in the first part of the book, dealing with the history of the church (Ágnes Ziegler), the history of the collection as well as with the later use of the medieval vestments (Wetter and Ziegler together). 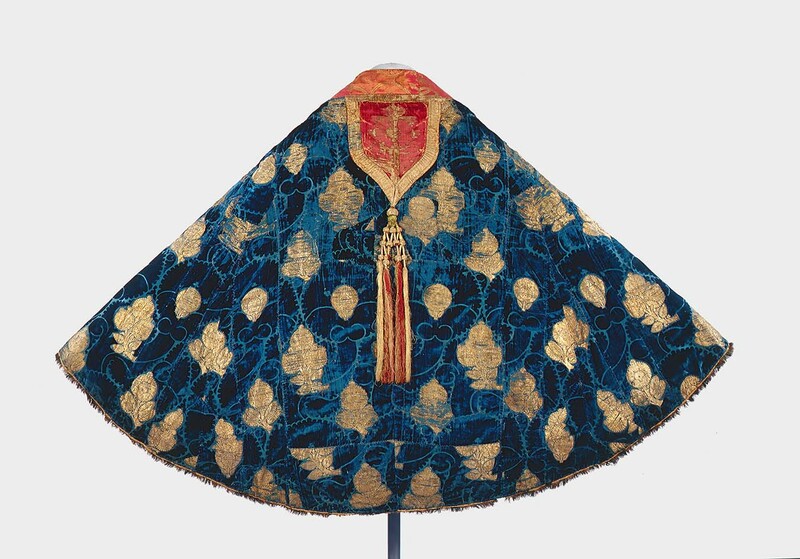 Corinna Kienzler authored important studies on later changes carried out on the vestments, as well as on the subject of the Italian or Turkish origin of the velvets. After the studies, comes the catalogue part, with detailed descriptions of the technical, historical and art historical aspects of the objects. Drawings and excellent photographs present the material as well. The book is in German, but a separate volume contains exhaustive summaries of the essays in Romanian, Hungarian and English. All of this was produced according to the very high techological standards we have come to expect from the Abbeg-Stiftung. 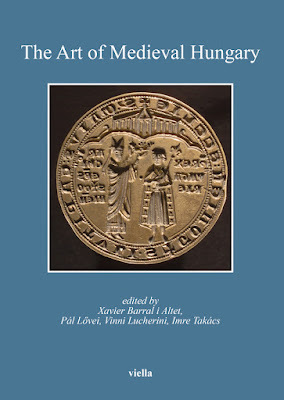 Overall, the book is not simply a catalogue of a significant collection of liturgical vestments, but a major contribution to the study of the history of a most important Transylvanian town and community, with major implications for the medieval art history of Hungary in general. The book was presented in Brasov by the authors on the 6th of June, along with a lecture by Ernő Marosi on the subject of communal memory. 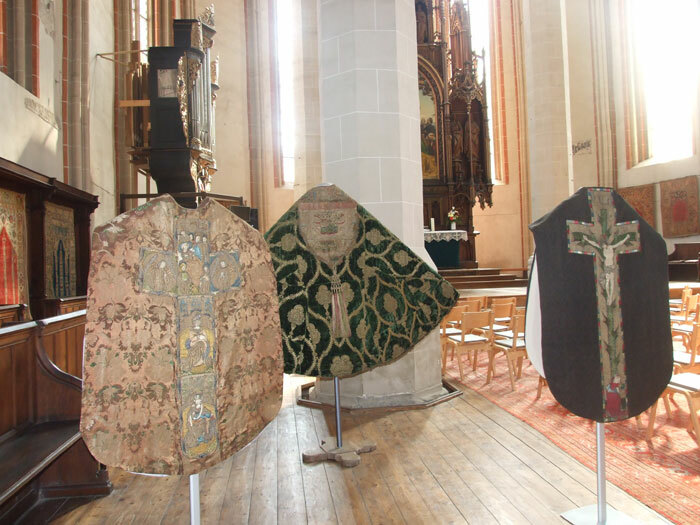 On this occasion, the vestments were presented to the public - see the photo on the left, and the accompanying article from the Allgemeine Deutsche Zeitung für Rumänien. Evelin Wetter: Liturgische Gewänder in der Schwarzen Kirche zu Kronstadt in Siebenbürgen. Mit Beiträgen von Corinna Kienzler und Ágnes Ziegler, Vol. 1-2. (Riggisberg: Abegg-Stiftung, 2015), 484 and 160 pp. More information of the website of the Abbeg-Stiftung. A Hungarian-language overview of the new publication can be found on the website of Obeliscus, an online journal of Early Modern Studies.